Left 4 Dead is the game that got me into the whole video game music thing. About the time I was first playing it I took a course at uni on film music, during which the lecturer took us through the music of Psycho. Pretty soon I realised that the tone clusters and the descending semitones Bernard Hermann used to freak people out in Psycho were also used in Left 4 Dead to the same effect. I started to listen a bit more closely to the music when I was playing games, and here we are. I’m going to write a few posts about pointing things out with music, because the games I’ve been playing lately all seem to do this differently and I think that’s kinda cool. 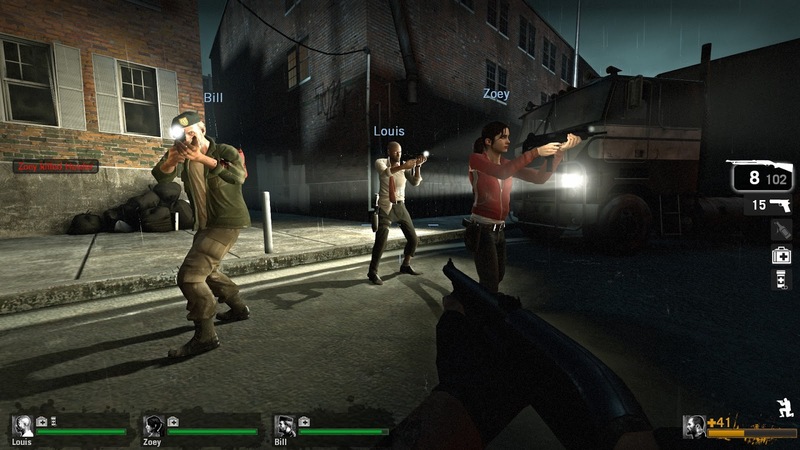 Left 4 Dead almost smacks you in the face with its musical cues. It uses leitmotifs for each kind of zombie you fight, and even one for the zombie horde that comes to eat your brains if you noob it up too much. If you’re not familiar with the term “leitmotif”, listen to the music that comes into your head when you think of Darth Vader or Indiana Jones. That music comes to your mind because it’s repeated when those characters have important on-screen moments — they’re like musical name tags for those characters. John Williams, who wrote the music for Star Wars and Indiana Jones, apparently loves leitmotifs heaps, and I think he probably got pro tips on their use from Wagner or Strauss or someone. Leitmotifs are a nice touch for a game like Left 4 Dead. It could have been a “shoot everything that moves” game like Quake or something, with a suitably “make all the noise” soundtrack. But a leitmotif-laden soundtrack gives Left 4 Dead a touch of cinematic panache and it gives you a heady dose of prescience, which is actually quite terrifying. If you can see a horde of zombies coming at you, you know where to aim. But musical information is not usually directional. If you only hear a bit of music that tells you they’re coming but not from where, you flail around nervously and fire off a few shots at anything that moves, less ignorant but powerless and scared because your impending death could come from anywhere. The focus turns from killing things to surviving. The game is better for it. I also think Left 4 Dead deserves a bit of kudos for its musical tutorial slash intro movie. The intro plays all of the leitmotifs as it introduces the “special infected”. If you bother to watch it, you learn things. Learning is fun! And so is not having your brains eaten. Double win.